Failure to properly characterize time-dependent behavior (i.e. 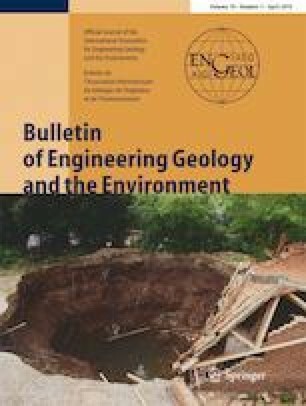 creep) of rocks and the use of inappropriate behavior models when analyzing stability of underground spaces such as mining drifts and stopes, road tunnels, different types of caverns and reservoirs for storing natural gas, petroleum fluids, and compressed air energy as well as nuclear waste disposal caverns will end up with costly losses. The most important factors affecting creep behavior of rock masses include composition of the minerals composing the rock, size of the grains or crystals of which the rock is composed, humidity, temperature, time, loading scheme, loading rate, strain rate and loading frequency. On this basis, in order to attain a proper understanding of creep behavior of rocks, it is necessary to determine creep coefficients of rocks via in-lab experiments. In the present research, rock salt samples were prepared in the form of cylinders at length-to-diameter ratios of greater than 2. Performed experiments in this study were long-term creep (LTC) tests at 6 stress levels of 5.5, 7.5, 10, 12, 14.02, and 18 MPa and stepwise short-term creep (STC) tests (each at 3 stress levels, namely 4.4, 10.1, and 11.9 MPa, and 7.5, 12, and 17 MPa, respectively). The tests were performed at ambient conditions at a constant temperature of 22 °C and relative humidity of 23%. Then, according to Burger’s rheological model and the Lubby 2 constitutive model and analyzing the obtained information from the tests, Kelvin’s viscoelastic coefficient and shear modulus as well as Maxwell’s elastic and viscoplastic coefficients were calculated. Also, obtained creep coefficients were improved using linear and nonlinear regression analysis of experiment dates. Experiments were carried out in the rock mechanic laboratory of the School of Mining at the University of Tehran. The authors are grateful for the favor and cooperation of authorities, especially Mr. Ebdali who has helped us in preparation of rock salt specimens.